For those interested in expanding their literary horizons, reading challenges are a great way for individuals with book blogs to get to know one another, discuss their current reads, and challenge themselves to read outside their comfort zones. Reading challenges usually run one year in length and ask participants to follow a set of rules in selecting their books, such as reading books in a particular genre, or only books with colours in the title. This year I’ve decided to participate in the 2010 Year of the Historical Reading Challenge, which asks participants to read and review at least twelve works of fiction (one for each month of the challenge) with historical content. For the month of January I read and reviewed Susanna Clarke’s Jonathan Strange & Mr. Norrell and submitted my review to a post listing other participants’ January reads. I’m already interested in checking out at least a few of the books reviewed by my fellow bloggers! Although I’m a little late for it, I’ve also chosen to participate in the Period Drama Challenge hosted by Lights, Camera… History!, which runs until July 1st 2010. Participants can choose to view at any level, watching and reviewing anywhere from 2 to 12 movies set before or during World War Two. My goal is to watch eight period films. Whether you’re interested in the historical or the literary there are certainly a number of challenges to interest any reader. Among my personal favourites are the Colorful Reading Challenge, which asks you to read nine books, each with a different colour in the title, and the Read the Book, See the Movie Challenge that offers multiple challenge levels to suit any reader. If you’re wondering What’s in a Name? you can find out with this challenge that creatively asks bloggers to choose six books, one each with a food, body of water, title, plant, place name, and music term in the book title. Bloggers can also read their names with the Read Your Name Challenge that asks participants to “choose books with first title letters that spell out your name” or support their local libraries in a challenge that requires you to read at least 25 library books during 2010. These do not have to be reviewed. For those interested in history, there are also some specific challenges geared towards the historical reader. 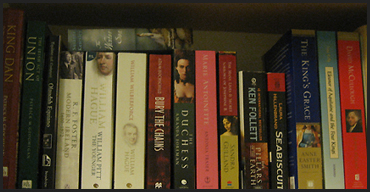 These include the the Royal Mistresses Challenge, encompassing works of fiction or non-fiction where a royal mistress is the central character, the Jean Plaidy Challenge, and the French Historical Challenge, which asks participants to read historical fiction or non-fiction books based on French history or historical figures. Wish me luck in my challenges for this year, and happy reading! Thanks for linking to the Royal Mistress Challenge! I’m doing Year of the Historical too, and also French Historicals. Plus the Tournament of Reading, which is for medieval fiction and non-fiction. What with all that I should get through quite a few historicals this year! What a great collection of challenges! I’d somehow missed the Tournament of Reading, but I might end up joining that one too. When I came across the Royal Mistress Challenge I thought it was a wonderfully original idea and I’ve been wavering over participating in it myself, so I wouldn’t be surprised if I ended up joining in the next month or so. Thanks for commenting! Wow, what a list of challenges. I participated in the Canadian book challenge last year, but didn’t keep up with it this year. It’s at bookmineset.blogspot.com. Your list is inspiring me to join up for one of these challenges. Thanks! It’s amazing just how many challenges there are out there. I’ve added the Art History Challenge since this post as there were a few novels on my to be read list relating to art already. I also plan to join the Jane Austen Challenge since I’ve never actually read any of her works, despite seeing many of the film and television adaptations. I hope you find a challenge to join that interests you! The English Patient is an interesting book/movie duo. The book focuses on the thoughts and the emotions of the characters, with the action as a backdrop, while the movie does the opposite. It really makes a cool comparison of the two different media.